When it comes to breakfast, I'm a savory girl. It's very rare I crave cereal, granola or pancakes. Bagels with cream cheese and lox, an omelet, or roasted potatoes? Those I would take any day. This past Sunday, I woke up at 10:30 am. 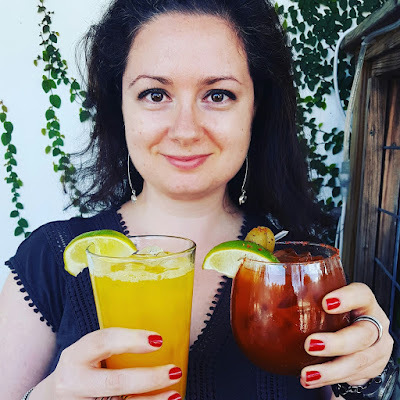 No, I did not go salsa dancing the night before. In fact, I even took a nap that Saturday. Maybe I just needed extra sleep. Or maybe, I did not want to face the messy kitchen I had to clean after a cooking date the day before. I woke up, turned on my computer, got caught up with Twitter, FB, checked my blog statistics, turned on the TV and tried to decide what to make for breakfast. That's when I decided to make pancakes. Why? Because I had some buttermilk left over in the refrigerator after making cheesy scones on Saturday. 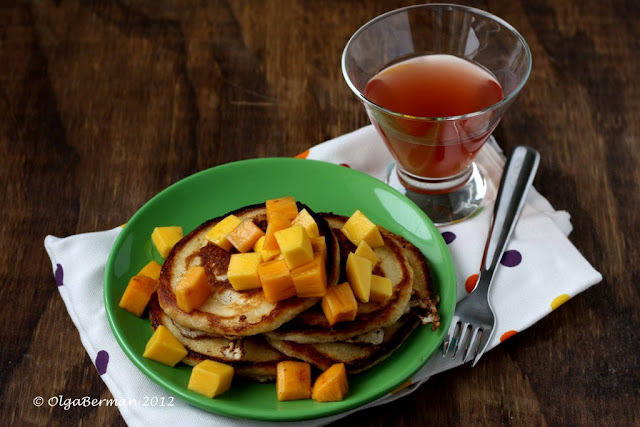 I did a quick search on line and found a recipe for Buttermilk Pancakes on Joy of Baking. You might be shocked to read this, but I followed the recipe exactly! 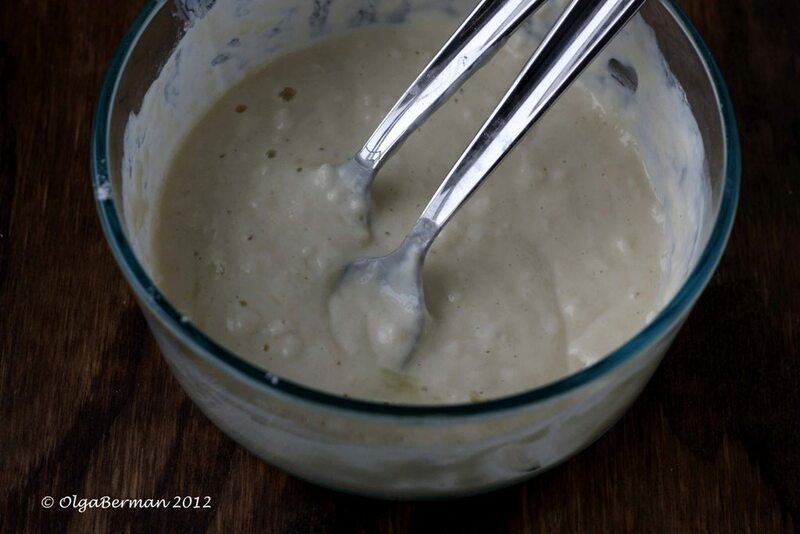 You then add the wet mix to the dry mix and incorporate the two without over-mixing the batter. A few lumps are fine. I cooked the pancakes in a bit of melted butter. 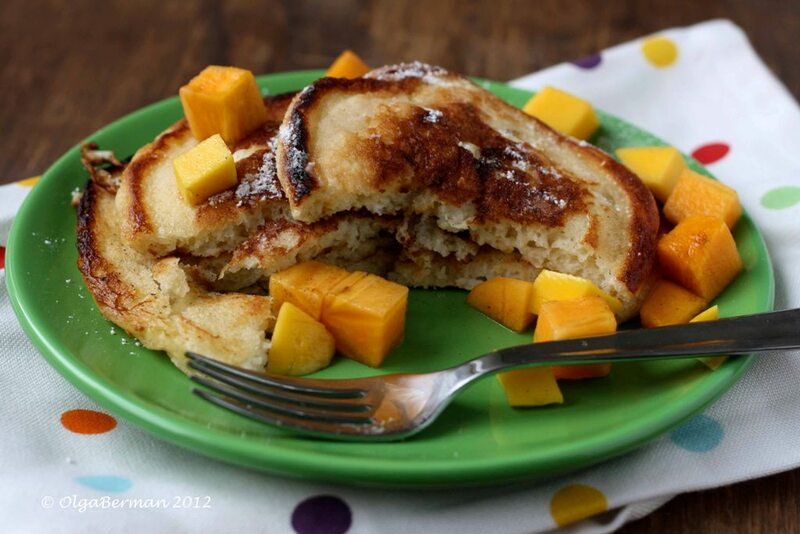 The best way to know when to turn your pancakes is to look for little bubbles to appear on their surface. Flip. Cook a few more minutes and you are ready to eat. How fancy does this look? 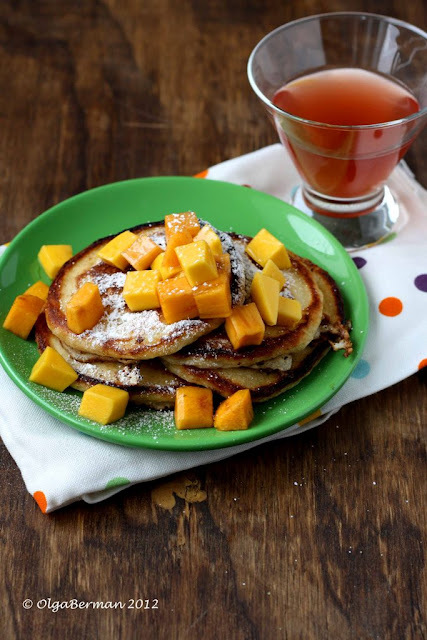 I served these buttermilk pancakes with boozy persimmons and champagne mangoes and a dusting of confectionery sugar. 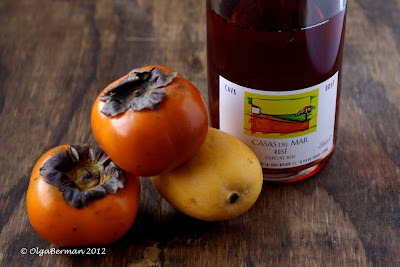 Not one to waste things, I drank the Cava that made those persimmons and mangoes boozy. The pancakes were fluffy, sweet, and crispy on the edges. This recipe is definitely a winner. Make this recipe tonight for dinner, or for breakfast over the weekend. Have a great weekend! See you next week. I'm much more of a savory person at breakfast too.. I like my eggs and hash, etc. That said, the idea of pancakes with mangoes is pretty mouthwatering! I would love a stack of those pancakes, they look delicious. Only I would need some bacon to go along with them. Yum! 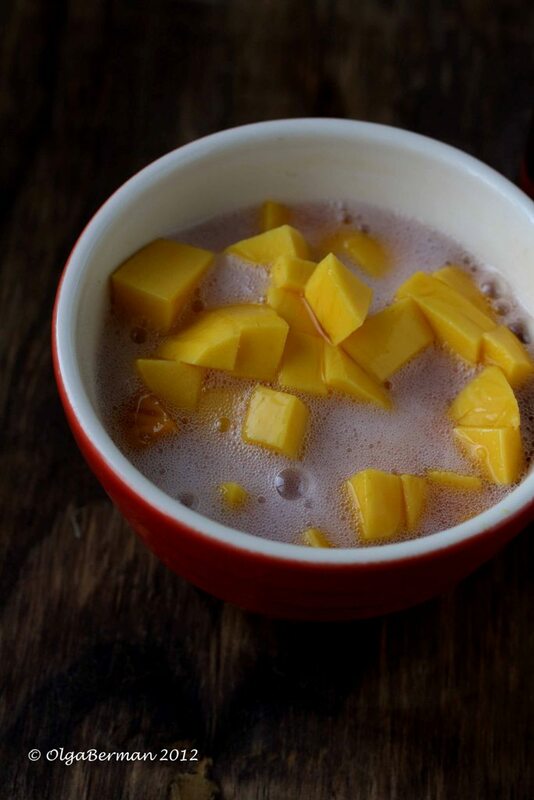 Mango is one of my favorite fruits. They really do justice to the pancakes! This is my new favorite pancake recipe. It took two seconds and I love the texture, etc. Delish and thanks for the inspiration! O now you've done it; I want those pancakes now too. Looks delicious and love the addition of the persimmons!! OMG...10:30? You lucky duck! I haven't slept past 8 in 9 years!!! 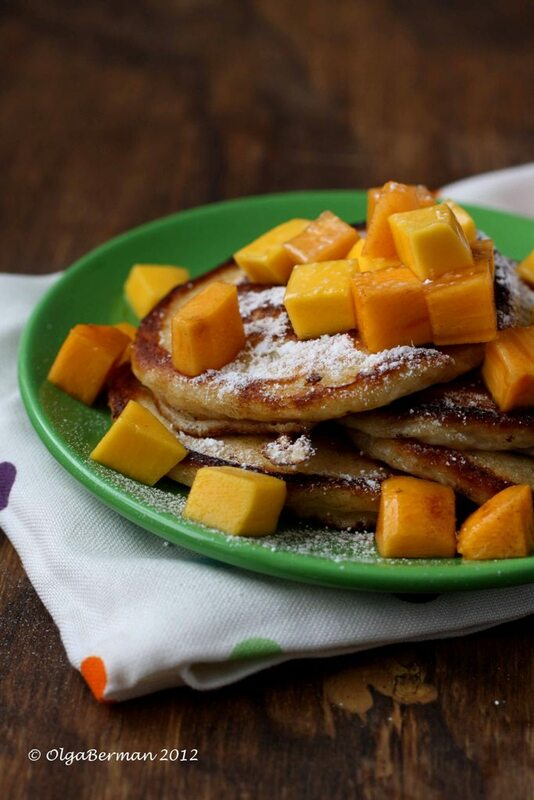 These pancakes sound divine. Buttermilk is the only way to go! Love the idea of soaking the fruits in cava! This looks delicious. Oh, I wish I found this recipe day earlier... we had Pancake Day yesterday in UK!